In the marketplace of full-size family SUVs, the 2017 Chevrolet Suburban is a force to be reckoned with. From its modern exterior to its spacious and well-appointed interior, everything about this big machine is designed to appeal to large families who need a powerful, comfortable and capable SUV that also places an emphasis on safety and strong resale. My car is reliable, nothing to worry about in that dept. The seats are not very comfortable; obviously a lower quality. The seats are also difficult to adjust. (adjustments are manual; it is hard to go backwards in quality. ) The paint chips easily along rim from getting in & out of car. The step in is too high & stepping out from back seat passenger side is even harder because you are standing, as the seat is shortened & away from the door. The first back seat does not lay down; it has to be taken out. The temp control knobs are too low. . . I have to look down too far to keep eyes on the road. Heated seats and steering wheels plus hazard awareness. I love my suburban however it does require a large amount of gas. My daughter plays competitive softball and there is plenty of room for all of her gear plus multiple teammates! She loves the car play option to play her music in the car and my favorite thing about my suburban is my heated seats and steering wheel. 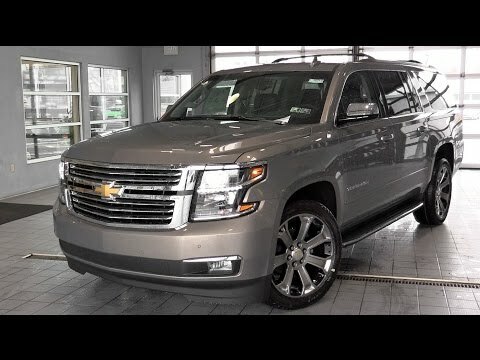 The suburban is very easy to drive and comfortable and has very few blind spots due to the exceptional mirrors as well as all the functions to allow you to be aware of cars on your side and objects you are too close to. No minivan for this cool mom! I am a busy mom with three children. My Suburban has a great deal of room inside with three rows of seats not to mention the spacious trunk. Room for the stroller as well as groceries. The DVD player is a life saver on long trips as well. The performance is amazing. For a larger SUV it has the space we need without being to big to drive. It's a busy mom's dream car and I'm not stuck driving a minivan. I would suggest to any parents , family's, or anybody who likes a luxury ride.